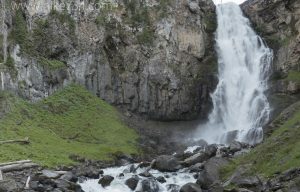 The enclosed Sheepeater Canyon makes for an intimate setting for the powerful Osprey Falls as the entire Gardner River falls approximately 150ft/45m. 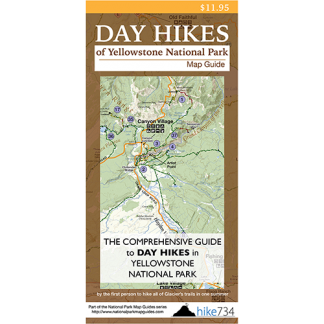 The trail starts at the Bunsen Peak trailhead and follows along an old road through meadows along the peak’s southern flanks. With the exception of the occasional trees, most of the walk is exposed. While this gives little respite from the sun, it offers unobstructed views. As the trail winds north, a peek of the Gardner River comes into view. Younger lodgepole pines become more frequent. The trail begins descending to the Osprey Falls Trail. The Osprey Falls Trail traverses the cliffs with views of the river, then steeply switchbacks down into the canyon. You don’t get any views of the waterfall until you are right at it. The Sheepeater Cliffs of the canyon feature fantastic basalt columns. Trailhead: Head south from Mammoth Hot Springs on Grand Loop Road, just past Golden Gate. Immediately upon entering Swan Lake Flat, look for an unsigned parking lot. The trailhead is behind the gate on the east side of the road at the end of the parking lot.